The private office, long a distinguishing feature of the corporate world, is evolving into a new kind of space. Dossier is classic casegoods furniture with a clean architectural look. 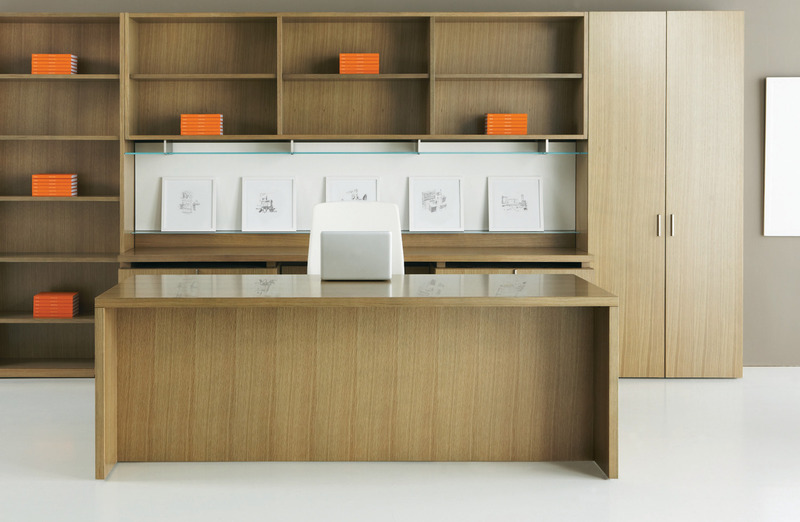 Layered surfaces and upper storage combine in multiple ways to meet user needs and spatial constraints. Low storage doubles as bench seating for visitors. Technology support is fully integrated into furniture design. Dossier is comprised of table desks and runoffs, credenzas, pedestals, cabinets, bookshelves, upper storage and freestanding tables for meetings and conferencing. All-wood traditional desk construction or open-framed table desk provides a lighter appearance. Desks can be modified with leather inserts, two modesty panel heights and a choice of setbacks.